Street Food Friday (Tuesday): Scouting for the Vendy Awards! One Saturday, I did what I had never done before… I had ventured into the depths of Brooklyn ALONE… all in the name of food trucks. In reality my friend Brian was supposed to meet me but wasn’t able to last minute, and I was in super safe Williamsburg. But we’ll pretend that I was being super adventurous on my own from the get go. The main purpose of this field trip was to discover and investigate Brooklyn food trucks for the Vendy Awards. My coworker and dear friend Emily works with them, and had enlisted me to research and take on this expedition as her proxy, since she couldn’t make it out that weekend. Regardless, I spent a few days researching, mapped out my course, and was off! First stop was the Brooklyn Flea in Williamsburg (27 N. 6th St btwn Kent Ave and East River). I hadn’t been to the Flea yet, so I was excited about that, but I was even more excited because this particular Saturday was the first Smorgasburg, and a bunch of food trucks had set up shop. First stop on the agenda, The Milk Truck! After some pondering, I went with the Three Cheese Grilled Cheese, and an Arnie Palmer to wash it down. 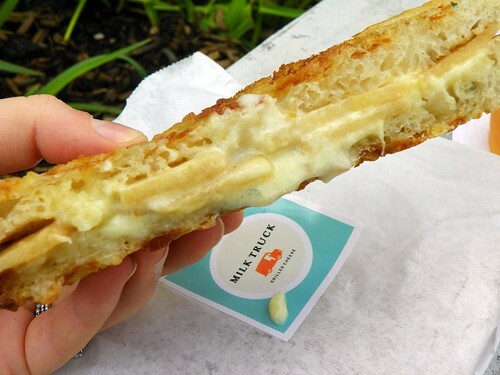 The line for the Milk Truck was long, but for a made to order grilled cheese, it was worth it. While the Arnie Palmer was only OK (it was a little tart for my liking), the sandwich was DE-vine. The cheese was melted to perfection, in between panini pressed bread. It was just the right amount of crispness, without being toasted to the consistency of a hockey puck. At first, you couldn’t taste the blue cheese, but then it slowly hits your palate, blending in perfectly well with the apple slices. It pained me to have to leave half the sandwich behind, but really, if I finished it, I wouldn’t have been able to visit any of the other trucks! Red Hook Lobster had a shorter line than the Milk Truck, but I think that was due to there not being a prominent sign on the Pound’s tent, and also because the lobster rolls were $16 each. I know for lobster that isn’t steep, but it hit my wallet pretty hard that day. While you could also get a shrimp roll for half the cost, I was here for lobster. I chose Connecticut style lobster (warm with butter) over Maine (with homemade mayonnaise), and chowed down. I have to say, for $16, you get some pretty decent pieces of meat! I even found whole claw meat. The bun itself wasn’t anything special, I viewed it as a vehicle for the lobster meat, and nothing more. It was nice that it was toasted though – made it a little sturdier for the handling. I did notice that some of the larger pieces were a little dry, but for a mobile vendor, I was impressed. I did wish the roll had more scallions though – it was kind of just added for garnish, but it was good with the roll! I decided to take a break at this point, and head away from the crowds at Smorgasburg. Plus, I needed dessert!! I headed up North 7th towards Artists & Fleas, where Coolhaus was parked. First off, this is one of the coolest looking trucks I’ve seen out in the NYC food truck scene so far. (Feed Your Hole is up there too.) The woman working on the truck styled herself like something out of a 50′s soda fountain advertisement, and I wanted her name to be Lucille or Betty. She rocked. There were so many different cookie/ice cream combinations to choose from, that it’s easy to get overwhelmed. I decided to go with a basic chocolate chip cookie, but mixed it up with Nutella toasted almond ice cream. (Mmm Nutella.) 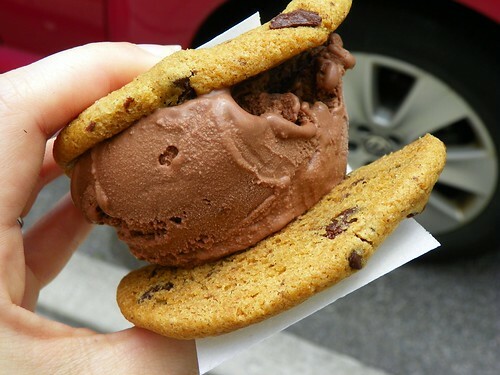 You can get multiple scoops in a cup or cookie sandwich, and can also get a ton of different gluten free options. If you get the cookie sandwich, it comes wrapped in edible paper. Right?! Right. The paper doesn’t taste like anything (yes, I tried… all in the name of food trucks), but I suppose that’s a good thing. You don’t want some delicious ice cream sandwich being ruined because the edible paper tastes bad. I do wish the ice cream fit a bit neater in between the two cookies, and also that I had someone to share it with, because it melted so fast in the warm sun! But the Nutella ice cream? Oh man was that tasty. I could have eaten a pint of it. After my melty, yet super yummy ice cream sandwich, I was once again ready for the savory foods. I headed to Bedford Ave, and walked down to North 3rd to experience the Endless Summer taco truck. Endless summer is a rarity among the food truck movement, because it was around really before the food truck movement gained momentum. It doesn’t have a Twitter account. It doesn’t move locations (it’s always on the corner of Bedford and North 3rd). The truck hasn’t been gussied up in signature colors or branding, save for “Endless Summer” written on the above the front window, and the black outline of a Mexican woman on the side. But seeing how popular this truck is with the locals, it doesn’t need all that. Compared to general food trucks prices, Endless Summer is cheap! It’s also quick, no frills, no nonsense and even though there’s a line, the one guy manning the truck is quick to fill everyone’s order without missing a garnish. I grabbed a chicken taco, and a Jarritos mandarin orange soda. 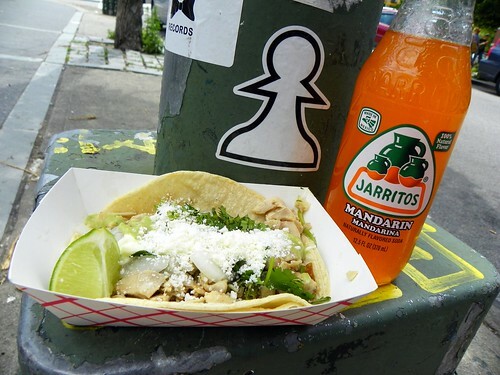 Without even going into the details of the taco, I have to say how much I loved that Jarritos soda! It was sweet and refreshing, and a nice change from Sunkist. As for the taco, I thought it was pretty good, but nothing fantastic. Maybe because I’m used to all these trucks trying to outdo each other, but the chicken was merely ok. It could have been more flavorful. However, the corn tortilla was nice, and doubled so the juices from the chicken didn’t immediately soggy it up. The raw onion, cojita cheese and cilantro also gave the taco a nice punch, but again, I would have loved little more from the chicken. My food truck frenzy ended back at Smorgasburg, where I hit up Asia Dog. (And the lines were still long! If you go to the Flea/Smogasburg – get there early!) The menu looked amazing, and I had trouble deciding what to get. (I also couldn’t believe I was still hungry, considering all I had consumed.) I finally went with a beef dog, and “the Vinh” as my topping of choice. 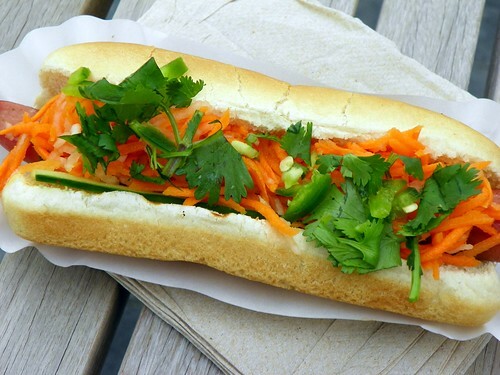 The Vinh is Vietnamese banh-mi style: pate, spicy aioli, pickled carrots, and daikon, jalapeno, cilantro, and cucumber. The dog was amazing. The beef was snappy on the outside, giving that great crunch when you bite into it. The flavors went so well together, I made a mental note to get Vietnamese food more often! I did wish that I could taste more of the cucumber and jalapeno, I kind of felt like the dog was smothered in carrots, and it overwhelmed the whole thing. And you can never have enough cilantro, in my opinion. I had a great time scouting for the Vendys, and I couldn’t believe my stomach made it through all that!! I guess you can never have enough of a good thing. Make sure you follow @VendyAwards on Twitter for updates and other food truck news. They’re also on Facebook: Facebook.com/VendyAwards. The awards take place in NYC September 24th! Vote for your favorite! That grilled cheese looks illegally delicious. And a chipwich? I die. Cookies filled with ice cream?? That’s pretty much the best idea ever! 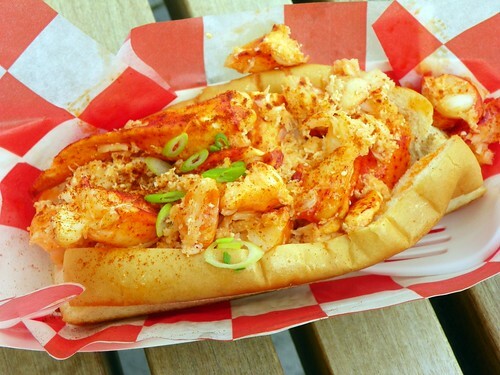 I’m totally going to track down some amazing street food when I’m in New York in September!! Wow that is quite a day of eating!! Everything looks delicious- I wish that we had more food trucks in our area!